Looking at a painting, the viewer desires to know a fixed or exact reading, but many a well-crafted allegory has mysterious and ironic twists that take the viewer through an unexpected path of understanding. How does meaning enter a painting? Is it possible for the artist to communicate a specific narrative using only symbolic language? How does a complex image invite a legible understanding in the mind’s eye of the viewer? Each subject of a narrative painting speaks as a symbol, allegory, or metaphor in concert to create a larger picture puzzle. While an artist’s secrets may be exposed in plain site, it is a function of allegory to hide as much as it exposes. Where is the magic of meaning and how has this historic process evolved to be used by the contemporary artist? Baade will discuss several contemporary painters’ methods for speaking through their art and the roots of this historic, visual tradition. 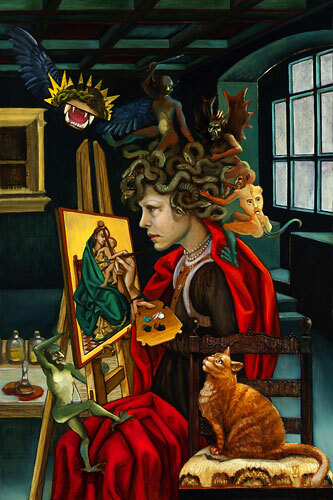 Carrie Ann Baade is an internationally exhibiting artist whose surreal oil paintings are rich with allegorical meta-narratives inspired by literature and art history. Her paintings have been featured in Metamorphosis, a survey of the top, contemporary Visionary Surrealists, and will be included in the up coming exhibit, Suggestivism curated by Nathan Spoor, at the Grand Central Art Center in California. She has been awarded the Florida Division of Cultural Affairs Individual Artist Fellowship, the Delaware Division of the Arts Fellowship for Established Artist, and a nomination for the prestigious United States Artist Fellowship. Recent solo exhibitions include: the Delaware Center for Contemporary Art, the Rosenfeld Gallery in Philadelphia, Billy Shire Fine Arts in Los Angeles, and the Ningbo Art Museum in China. Her work is represented by Pop Gallery in Santa Fe.